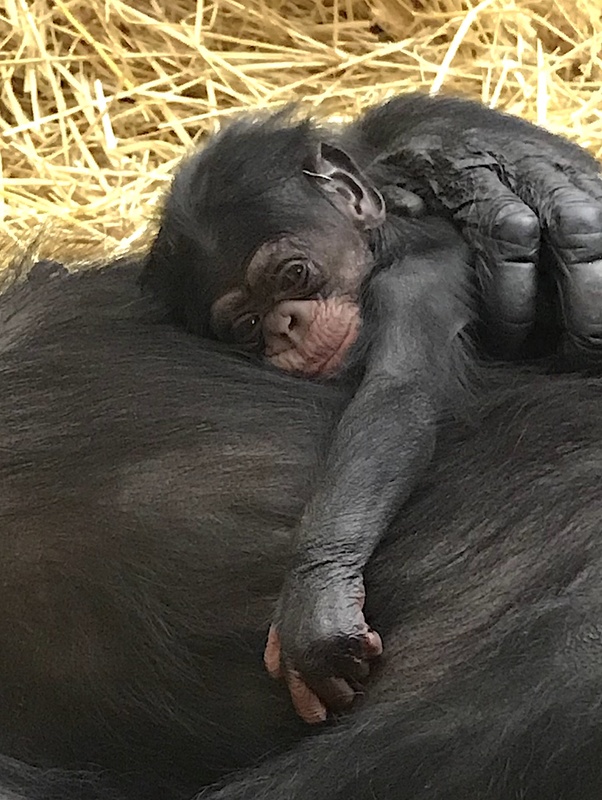 While newborn photos of a female baby chimpanzee have gone viral on our social media accounts, they weren’t the first images taken of little Jane. 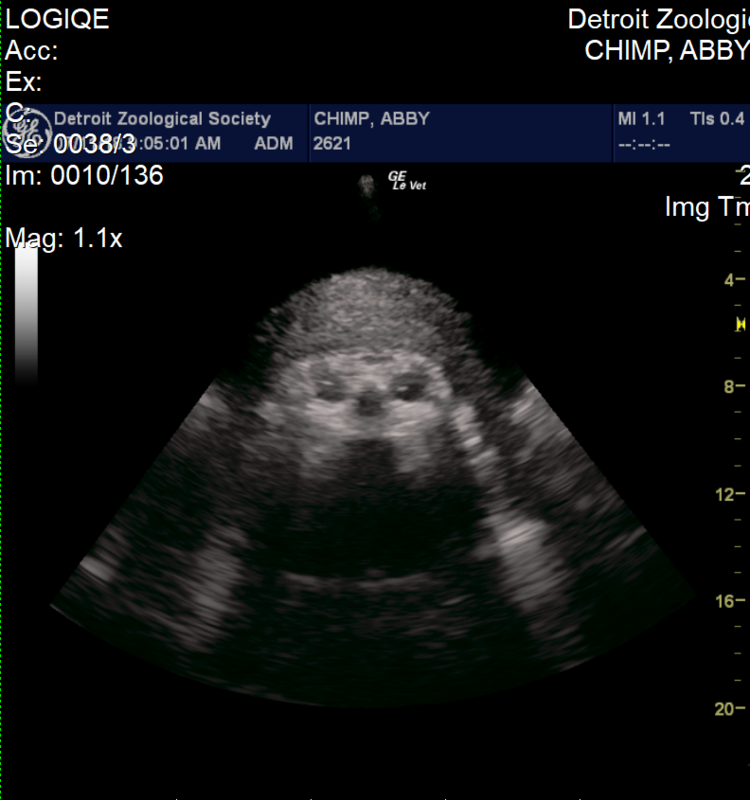 During mom Abby’s 33-week pregnancy, Detroit Zoological Society staff performed eight ultrasounds of the baby, who is named after legendary primatologist and anthropologist Dr. Jane Goodall. Staff works diligently with the great apes who live at the Detroit Zoo to develop behaviors that allow us to monitor their health. The gorillas and chimpanzees open their mouths to let us look at their teeth, show us their hands and feet and lean against the mesh to allow the administration of vaccines. Most of the chimpanzees will press their chests toward the mesh so we can take images of their hearts with an ultrasound probe. Abby quickly learned to position herself and allow us to put the probe on her belly so that we could monitor her growing fetus. After a few practice sessions, we invited an OB (obstetrical) ultrasound technician to the Zoo to take the standard measurements collected during pregnancy in human women. Abby was a cooperative patient and always appeared excited to see us. She would prop herself on a ledge and eat peanuts during each exam, allowing the peanut shells to pile up on her growing belly. There are limits to the ways we can position the probe, and we were not always able to get every measurement at every visit. In the early months, we were able to measure the length of the fetus from the crown to the rump; as the baby grew, we measured the circumference of the head and abdomen and length of the long bones, including the femur and humerus. 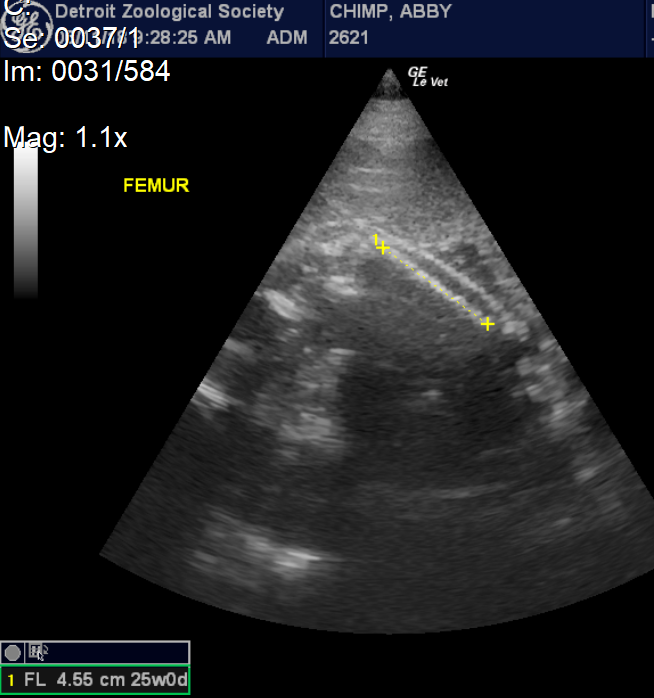 We were also able to see the position of the fetus and measure the heart rate. With each exam, we added data to our growth charts, and were pleased to see steady growth and development. We also became increasingly confident that the baby was a girl. Abby is the third chimpanzee mom that has allowed us to conduct obstetrical ultrasounds, and since 2008 we have been able to collect measurements from three pregnancies, including youngsters Ajua and Akira. 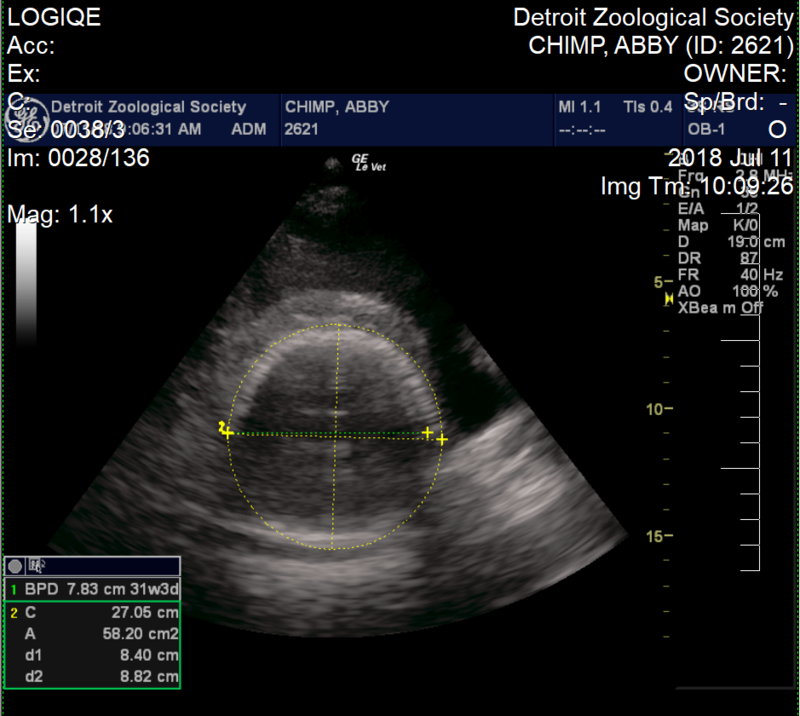 Using these measurements and data from two scientific publications, we were able to make a solid prediction of Abby’s due date – July 14, the date of the first annual World Chimpanzee Day! As this date approached, animal care staff began round-the-clock checks to look for signs of labor. Just three days before the due date, we performed a final ultrasound exam. We were pleased to see that the baby was still growing according to expectations. We could see her face and watch her open and close her mouth and wiggle her arms and legs. Most importantly, we could see that the baby had a strong heartbeat and was positioned with her head down, which is the correct position for a normal delivery. Anyone who has anticipated the delivery of a baby knows that due dates are not an exact science. But Abby delivered her baby at 12:01 a.m. on July 14, one minute into the day predicted as her due date, and the delivery was without complication. Being able to monitor babies during pregnancy allows us to prepare for any issues that might arise, and to intervene if needed. Abby is a wonderful mom, and is taking good care of Jane. She seemed excited to show off her new baby to the other chimpanzees, and held her against the window for everyone to see. We look forward to watching her grow and thrive in her habitat at the Great Apes of Harambee. It’s always so exciting when newborns arrive at the zoo. Congratulations to mom Abby and to all the staff at the Detroit Zoo on her safe and healthy arrival. She’s adorable! Looking forward to visiting soon to see mom and baby and their interactions with the rest of the troop.